E-710BK	- Plug-in Oil Warmer with dimmer control. Orange Ovals on Black Plug-in Oil Warmer with dimmer control. Red Ovals on Black Plug-in Oil Warmer with dimmer control. Yellow Ovals on Black Plug-in Oil Warmer with dimmer control. Round Black Crystal Plug-in Oil Warmer with dimmer control. Round Clear Crystal Plug-in Oil Warmer with dimmer control. Round Green Crystal Plug-in Oil Warmer with dimmer control. Round Pink Crystal Plug-in Oil Warmer with dimmer control. Round Purple Crystal Plug-in Oil Warmer with dimmer control. Round Red Crystal Plug-in Oil Warmer with dimmer control. E-714BK	- Plug-in Oil Warmer with dimmer control. E-714BR	- Plug-in Oil Warmer with dimmer control. 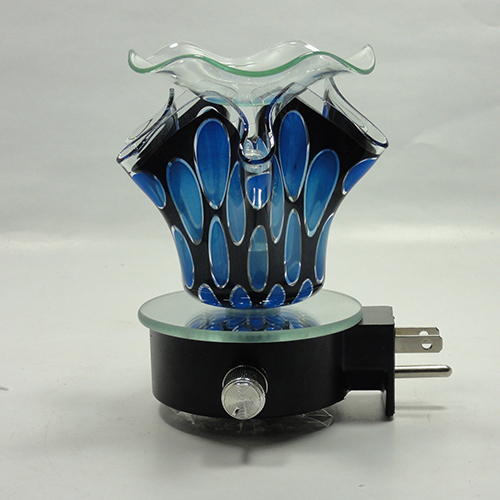 Round Blue Fractal Plug-in Oil Warmer with dimmer control. Round Black Fractal Plug-in Oil Warmer with dimmer control. Round Green Fractal Plug-in Oil Warmer with dimmer control. Green Fractal Plug-in Oil Warmer with dimmer control. Purple Fractal Plug-in Oil Warmer with dimmer control. Red Fractal Plug-in Oil Warmer with dimmer control. Black Fractal Plug-in Oil Warmer with dimmer control. Blue Fractal Plug-in Oil Warmer with dimmer control.